About us - Северная Луна. Питомник Аляскинский Кли Кай и Сибирский хаски в Рязани. 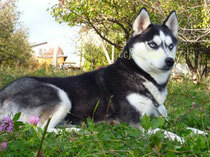 We deal with this breed of dog as the Siberian Husky dog is truly amazing in its beauty and originality. We are located near the city of Ryazan, Russia. As breeders, we are primarily interested in the pursuit of excellence and consolidate existing ones. We stick to the classic, standard colors, and masks, in our opinion, a perfect beauty, symmetry.